Arthur Maes started playing and study music at young age. He inherited the passion and love for music from his parents. His mother was a singer and his father a guitarist. He first practiced the piano at a classical academy and afterwards took back on the guitar, with different teachers and schools, in different styles of music (classical/rock/blues/jazz). He graduated at the Tritonus Jazz Studio of Antwerp in 2007. He played with many bands, not only as an instrumentalist, but most often also as composer and music-director. Amongst his main productions are M.A.F. Orquesta & Soul T and North Sea Ska Jazz Band. 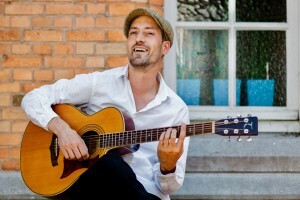 He also organized a lot of jam sessions in the Brussels area and played with several Latin and African musicians. He’s also a member of the Class & Jazz teachers team.